Friday, the weather reached a ridiculously wonderful 67 degrees. I was in paradise! Yes, that is not considered summer weather by any means, but it felt so fantastic to prance outside and feel ‘thawed out’, if any of you know what I mean haha. After the chilly 30 and 40 degree weather we have been having, Friday, March 1st, finally felt like spring really is just around the corner. I was also feeling very springy and colorful as I’ve been packing all of my summer finest as I’m heading to Hawaii on Wednesday! I am extremely excited for a much needed vacation, especially in Hawaii, as I have only ever been when I was a baby, and obviously I don’t remember that! To usher in this warm weather, I spent the day running errands in cuffed jeans, wedges, a short sleeve lace peplum, and a pretty peach statement necklace. A very natural, plain look, that I complimented with bare, unpainted fingers and toes. I really felt like a fresh look was in need for a day that felt like fresh beginnings with spring coming. Do you guys know what I mean?? I picked this lace peplum up from Target for $20. After getting it home and trying it on, I LOVED the fit and had to go back to buy one in green. I’m terrible at buying multiples of things I love. 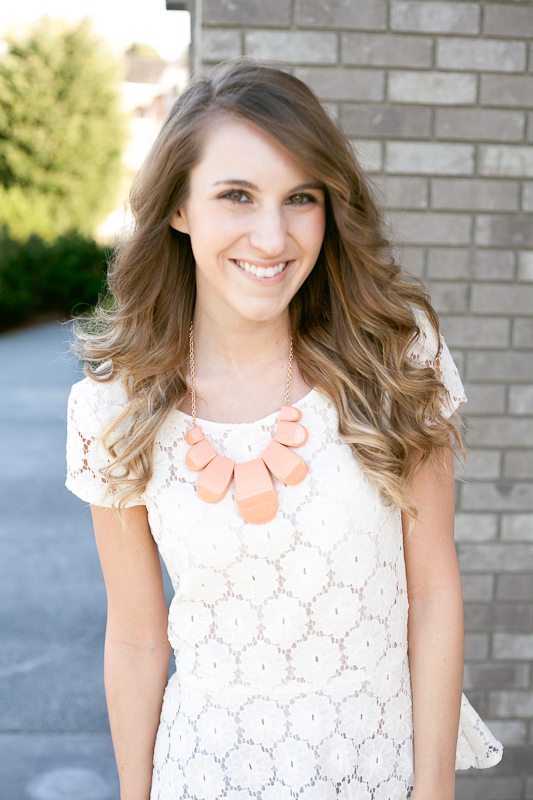 I added this chunky statement necklace in peach from Rire Boutique for the perfect pop of color. This necklace is the ultimate statement piece and I adore how chunky it is. For $24, I feel like it is such a steal, as I’ve seen EXTREMELY similar necklaces (as in almost identical) on other high end websites, selling for upwards of $50. Whats even better? This necklace comes in a variety of pretty springy colors, including lavender, yellow, peach and mint. 67 degrees… oh man, Ashley, that sounds so nice!! Yeah, that would definitely thaw me out as well. I'm getting to the point where bike rides in 30 degree weather are becoming a bit too numbing to my body… hahaha. Can't wait until it warms up a bit (but not too much!! If only it could be 67 degrees all the time). Jealous, girl, I am extremely jealous. Haha, its been stuck in the 40's here and it feels even colder because of the wind chill! I cannot wait to start wearing sandals and open toed shoes again too! Although I think I need to clean up my nails…hehe, they're in bad shape right now. I LOVE the back of that shirt. SO cute. 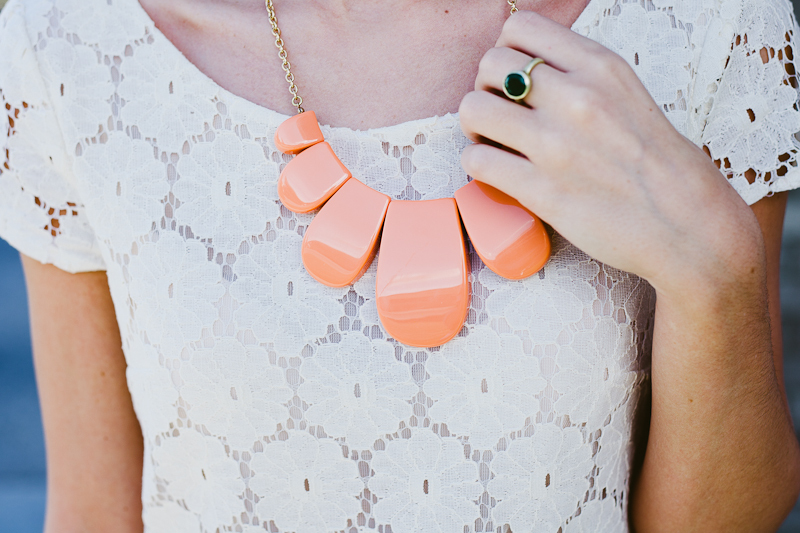 Very pretty look for spring – love the pastels and that gorgeous statement necklace! This really is the perfect spring look! I'm insanely jealous of your spring-like weather. This top and necklace are both adorable! Just saw this top in the Target flyer and need to get it asap- so cute! Yupiiie, glad you're having a warm weather there. WOW, your sandals are a dream!!! it indeed is a very pretty necklace and pastels just are perfect for spring. I also completely love those wedge sandals. the brown shade and their shape – perfection. I love the whole set! Have a nice trip to Hawaii!!! Love the peplum top on you-too cute! IN LOVE with this outfit! I must add more peplum tops to my wardrobe. So cute! Looking great.. You know, whatever outfit you wear, your charming smile glorifies it.. Always beautiful and always great sense for latest fashion clothes…! I am in love with this whole outfit! Especially that peplum top! You rock it! i love how fresh you look! this peplum top is so gorgeous and makes me want spring x <3! Ahh, so jealous of your weather! Man, we're covered in icy snow! 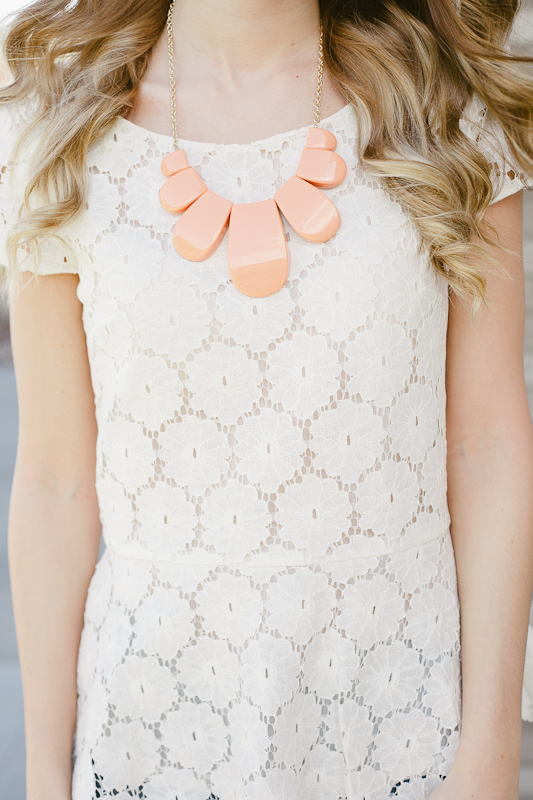 That lace top is too cute and your chunky necklace is the perfect touch. I always love your simple-chic style. Thanks for your sweet comment–I featured it as my fave!